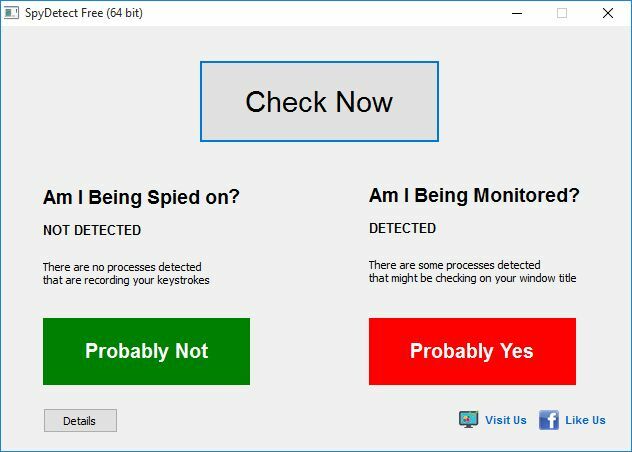 SpyDetectFree can detect processes on your computer that might be spying on your keyboard inputs (keyloggers). Simply run the app and click Check Now and wait for the results. Technically, SpyDetect checks on your computer for processes that installed HOOKS on your keyboard. This is how SpyDetectFree detects processes that might be recording your keystrokes, as using hooks on keyboard is the most common practice when recording keystrokes pressed. NOTE: For 32-bit Windows, get SpyDetectFree (32-bit) instead.